Can you believe there is such a thing to relieve tired, aching legs and feet? This week my legs feel like I have been dragging my feet through heavy sand. I have no aches and pains but just tired legs. Tuesday's track workout began with an easy 2 mile jog in shoes and .5 mile barefoot. Cool down was an easy 1 mile barefoot jog. Wednesday was a 20 minute swim at lunchtime. In the evening I was hoping to ride my bike outside but after getting ready to go out the weather turned bad with dark clouds, thunder and rain so I set up my bike on the trainer and did a 1 hour spin. Thursday's tempo run on the track included 1 mile easy jog then 5 miles at 31:57 followed with a 1 mile cool down jog. Even though my legs are tired I am amazed I survived hard workouts this week. Next week training will not be as tough and hopefully the legs will be rested enough for next Saturday's 10 mile race. 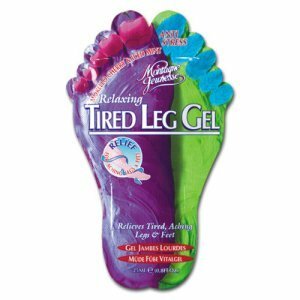 Instead of buying into the marketing of the magic gel I think I'll just give my legs some rest and a massage. Tuesday and Thursday also included upper body dumbbell workout with the exercise ball. Tomorrow will be a 40 minute swim at lunchtime and after work I hope to get in a 40 minute bike ride. So you're actually getting used to the barefoot running now? Oh by the way can you juggle while running? Nice going there, you're really cranking out them workouts! you really packed it in. Barefoot running.... I run in Nike Frees and love them. I'm told I should go to another shoe wiht some suchioning and stability, but why rock the boat if it's working! That's for your post! I love 'a state of mind in shich one's desires are confined to his lot whatever it may be'.